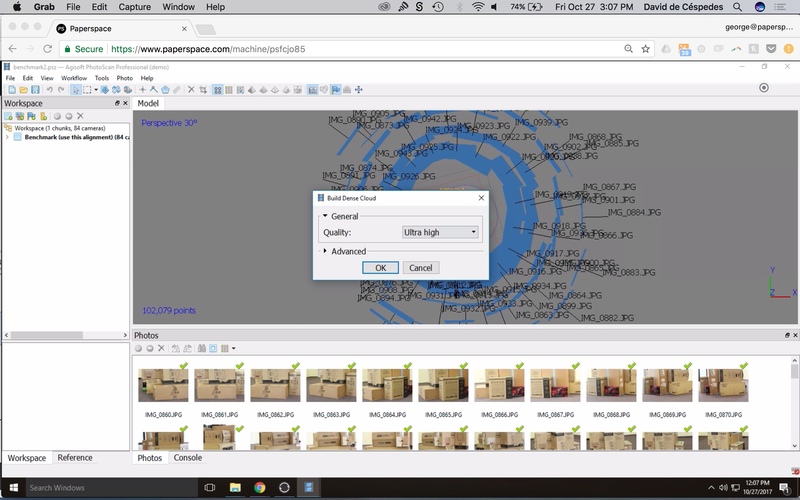 With Paperspace's powerful GPU's and Photoscan's GPU Accelerated workflow, processing of large image datasets can happen in hours not days. 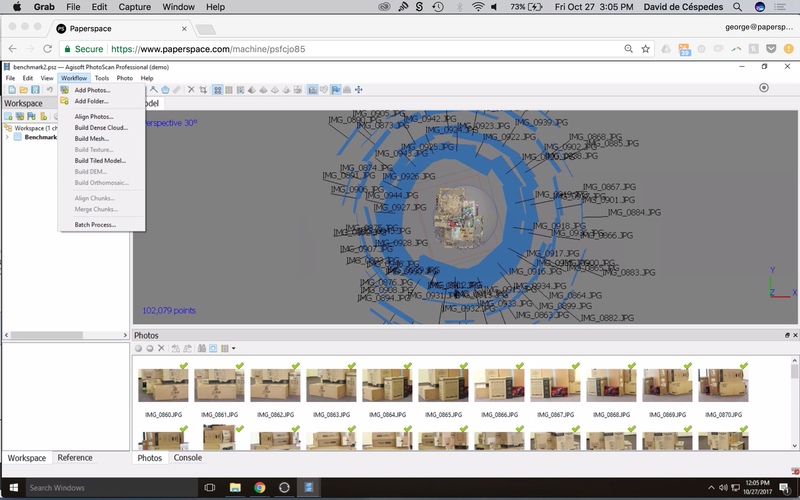 This walkthrough will cover the power of GPU acceleration with Photoscan and Paperspace. Agisoft Photoscan offers the ability to leverage either your machine's CPU or GPU when processing image datasets. With their GPU Acceleration feature, what would normally take close to days to process can now be done in a couple of hours. This speed increase depends highly on the project, the number of images, the image size, and the image content. As a rule of thumb, projects with high overlap, high image content and thus with a high number of keypoints benefit more from the speedup. So how we do enable this in Paperspace? In the GPU section, select or unselect the GPU device. We've put together some helpful benchmarks to between CPU and GPU on Paperspace's P5000. We used the benchmark file provided by Agisoft in order to build a dense cloud model on Ultra High settings. Note: In order to test the CPU -- GPU should be disabled. This model would take an estimated 32 hours to complete processing. Note: Make sure CPU is also enabled in the GPU tab. This model would take an estimated 1.75 hours to complete processing. Photoscan's GPU Acceleration is a powerful feature that can make use of Paperspace's NVIDIA GPU infrastructure. 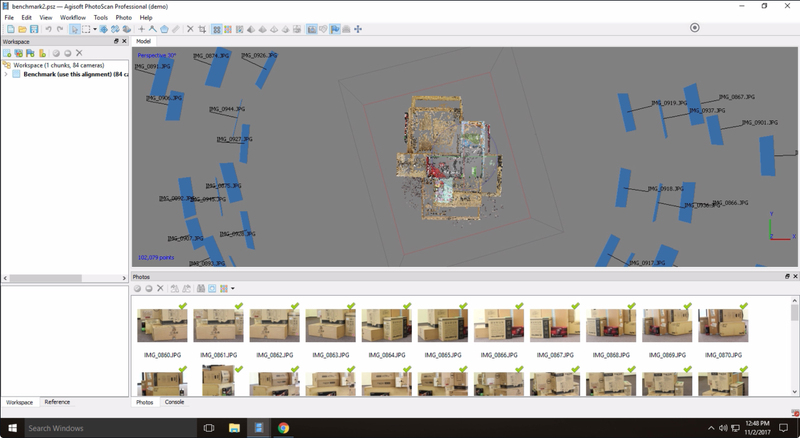 In our simple benchmark between CPU and GPU, we demonstrated the huge gains Paperspace's infrastructure can provide to GPU accelerated photogrammetry in Photoscan. We hope you'll share your own results and experiences with us at hello@paperspace.com.